New Zealand is an island nation in the south western Pacific Ocean. A land of immense and diverse landscapes of spectacular beauty, with a temperate maritime climate, moderate rainfall and many hours of sunshine there is relatively little pollution compared to other countries. Most of the country lies close to the coast, and air quality is high. Rainfall is evenly spaced throughout the year and pastures are rich in the essential nutrients ideal for dairy farming and agriculture. Antibiotics and growth hormones are NOT used. 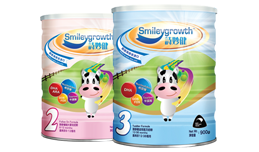 Only 100% New Zealand milk powder is used in all Smileygrowth™ products, and all are totally produced in New Zealand. NO production takes place in China. High standards and an unwavering adherence to quality by New Zealand's dairy industry has made China the biggest importer of New Zealand dairy products by value. About 353 million kilograms of New Zealand's milk products in 2010, up from 69 million kilograms in 2008. ©2014 New Zealand Focus (HK) Ltd. All Rights Reserved.